or even just for the family! No Software to Load or Learn. of Customers all Year Long. 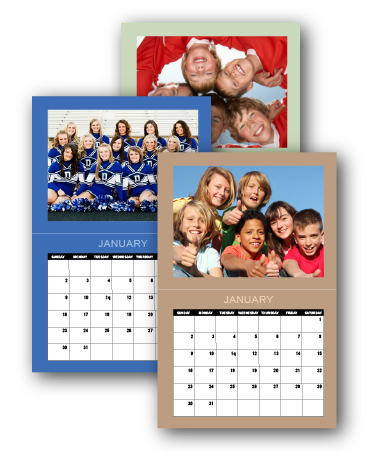 Calendars are a great fundraising tool for any type of organization. The high personalization makes them more relevant to your supporters and your sponsor logos will be highly visible all year long. Over the years we have helped thousands of organizations raise needed funds for their causes. We understand that your time is limited, and your need is immediate, so we have a streamlined and simple way for you to create a fundraising calendar that is both beautiful and useful to your audience. Our goal is to help you achieve your fundraising goals. There is no need to download or learn any new software, you simply create your calendar online using photos of your choosing. You will see a proof online and also get one via email for reference or to show to committee members. Upon approval we print and ship your calendars to you to sell. Most clients tell us they earn a minimum of 50% profit. Raising funds for your organization can be challenging but we are here to help make it easier and more effective. Get started today. Generating a minimum of a 50% profit! Everyone needs a calendar, as some 75 million are sold annually, but you have the only one in your market that is customized to your members and affinity groups.